What is the Offline Trace tool? The Offline Trace tool lets you view and analyze trace sessions that were previously saved. A saved trace session is essentially a "recording" of a trace session, and can be useful for cases where troubleshooting and further analysis is required. The UI for the Offline Trace tool is similar to the "live" Trace tool. To learn about the Trace Tool UI and on saving trace sessions, see Using the Trace tool. Open the Trace Tool, as described in Using the Trace tool. When the trace is completed, select Download Trace Session. The downloaded trace is stored in XML format. To open the Offline Trace tool using the New Edge UI, select Develop > Offline Trace in the side-navigation bar. Select APIs > API Proxies from the main Apigee Edge menu. 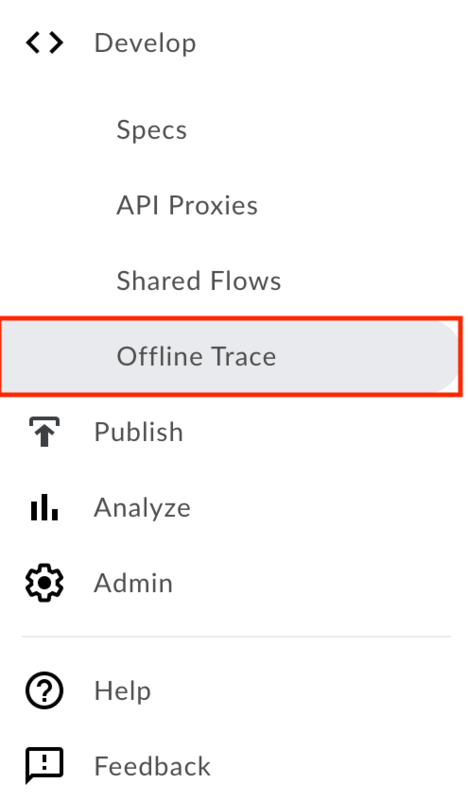 On the API Proxies page, click Offline Trace. In the Offline Trace tool, click Choose File and select a downloaded trace file from your system.